KEEP CALM AND CARRY ON: Master Bedroom Design: Advice Wanted! Master Bedroom Design: Advice Wanted! 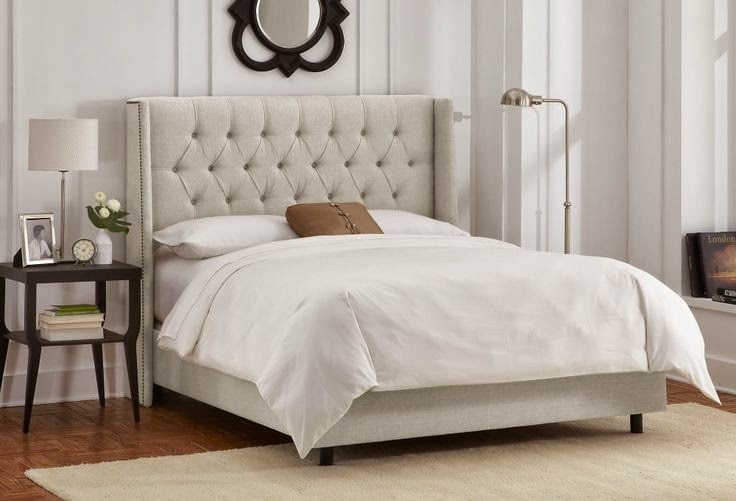 Not too long ago, I shared our new tufted wingback bed (still so happy about it) we got for our master bedroom and now I'm trying to decide between two different nightstand situations, so I thought I would turn to all of you to help me decide! Right now, our dresser and nightstand are an antique cream color (we moved our old set into one of our guest bedrooms) similar to this one from Pottery Barn. We only have one nightstand right now and I want to get one for my side of the bed....which means this: mismatched nightstands. 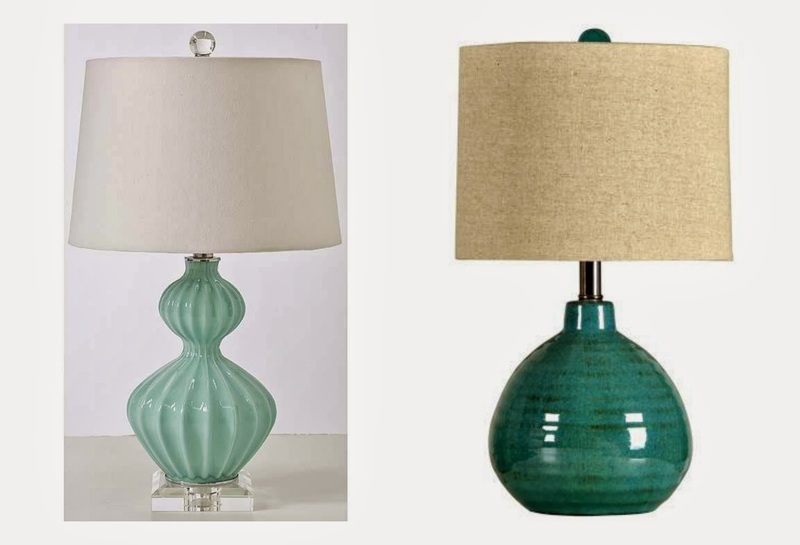 I've seen this look all over Pinterest and decided that if I were to do this that I need to get two identical lamps for both of the nightstands to tie it all in together. My situation is this....do I go with a mirrored nightstand (like this one or even a small one like this) for my side and get ceramic colored lamps for both of them (because our room definitely needs more color), OR do I just buy two colored matching nightstands (and just get white or clear lamps for both)?! 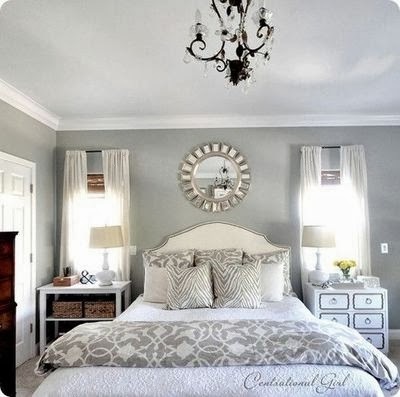 When I see pictures of rooms with mismatched nightstands like the ones above, I really like the look (especially the first one) and think it would be OK, but I'm still torn. 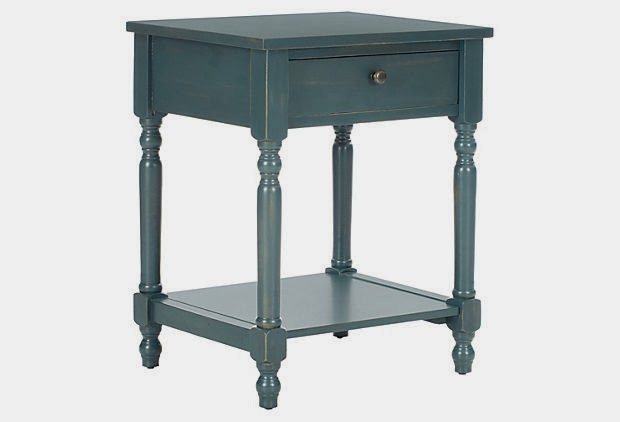 Do you think our room can pull off the mismatched look with a mirrored one or should I just get two new nightstands in a pretty blue/teal color similar to this? Help a sister out, would you? Happy "Friday is ALMOST here", everyone! I like the mirrored one, but I think you'd (at least I would) get sick of them pretty quickly, the mirrored furniture seems like a trend that will fade quick. The other option, while teal, is more traditional and maybe would last longer? haha :) very true. thanks for your input, Chels! Hi, new follower. Love your blog! My vote is always stay traditional with furniture, because your taste changes quickly and you can easily buy new lamps, pillows, etc. but your furniture is more constant. I love the mismatched nightstand look from the Centsational Girl blog (pic 2), and I think that'd be easy to pull off. And I agree with the mirrored nightstand comment from above, that it looks really cool but might be a fad. I think if you were gonna do it, you'd want to make sure it was a room full of natural light otherwise the mirrored nightstand might not be as pretty as you'd expect. I mean, I've never been in your bedroom, so I don't know what your lighting situation is ;-) haha but keep that in mind! I work for an interior design company and am by NO means a designer (just an assistant), but I will say that in this industry, if mirrored is an option they always choose it. I also like the mismatched nightstands but they RARELY ever do it- only if the client asks for it. So it really depends on what you think you'd be able to live with everyday. You have to wake up to it every morning, so which one wouldn't drive you crazy? so interesting, thank you! I really like the mirrored look and can find one for pretty inexpensive, so if I go that route that's definitely a benefit especially if they go out of style in a few years! I would never have thought to do mismatched nightstands - but that is a great idea!! I love the mirrored look - but do tend to agree that tradition may be the way to go and then accent with the lamps! I have mismatched nightstands in my room and love the look. They both compliment each other, but I like that it’s not so matchy matchy. With the mirrored nightstands though I feel like you would need two instead of one mirrored and one non-mirrored. LOVE the headboard! I love the idea of the mirrored with the ceramic lamps. You could always tie them in with a similar colored throw on your bed as the lamps. The mirrored is classic and very pretty and I think a great compliment to the beautiful headboard! My husband and I are building a house right now, and we are getting a new master bedroom suit. We have look at different places for furniture and I have searched pinterest but I just feel like I wont be able to make it as cute as all these pictures I see! Trying to decorate is hard work! But I really like the mirrored look! So classy! love them all... stalk home goods and eventually you will find what you are looking for! We have mismatched, but matching lamps and I love it! Do it...I love the mirrored look, but showing of prints, dust or markings would drive me batty. I adore that bed! The maintenance on the mirrored ones would be crazy! You'd constantly have to windex them! haha. We have plain, antique white nightstands and bright colored lamps! I love the mismatched night stand idea BUT I personally have a huge thing for symmetry so I think they need to look balanced. I am curious to know if your room has windows on the sides of the bed like the inspiration pictures? If so, I think that would help balance things as well. Love that bed and have one very similar myself and stick with the same night stands but different decor accents on each. Mismatched. Really like that idea. The only reason I am not a fan of mirrors is because of fingerprints. You would literally see them everywhere!